Posted: Mon Mar 21, 2016 5:25 pm Post subject: Mayes, Robert. Cemetery/Memorial: Tower Hill Memorial, London Grave Reference: Panel 123. Additional Info. 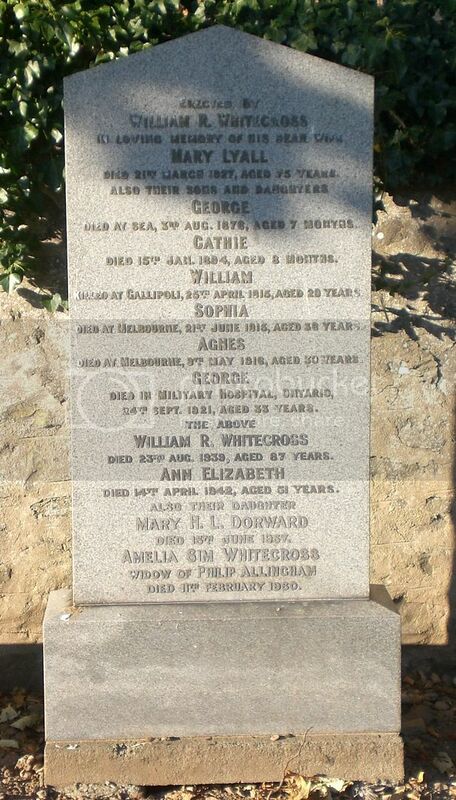 Husband of Wilhelmina Mayes of Tayport, Fife. Posted: Mon Mar 21, 2016 5:27 pm Post subject: McPherson, John. Cemetery/Memorial: Bailleul Road West Cemetery, St Laurent-Blangy, France. Grave Reference: A. 15. Additional Info. 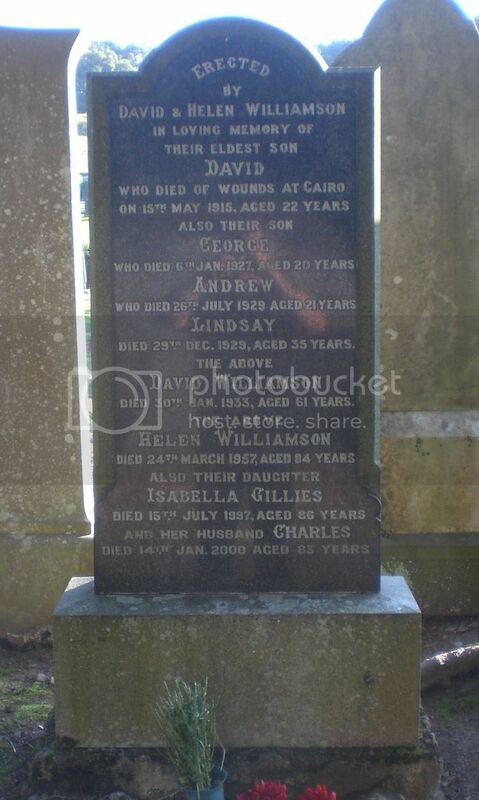 Son of Elizabeth McPherson of 24 Cowgate, Tayport, Fife. Grandson of John and Helen Brand McPherson. Posted: Mon Mar 21, 2016 5:28 pm Post subject: McRae, Donald. Cemetery/Memorial: Khayat Beach War Cemetery, Palestine Grave Reference: D.G. 15. Additional Info. Son of William and Frances H.S. 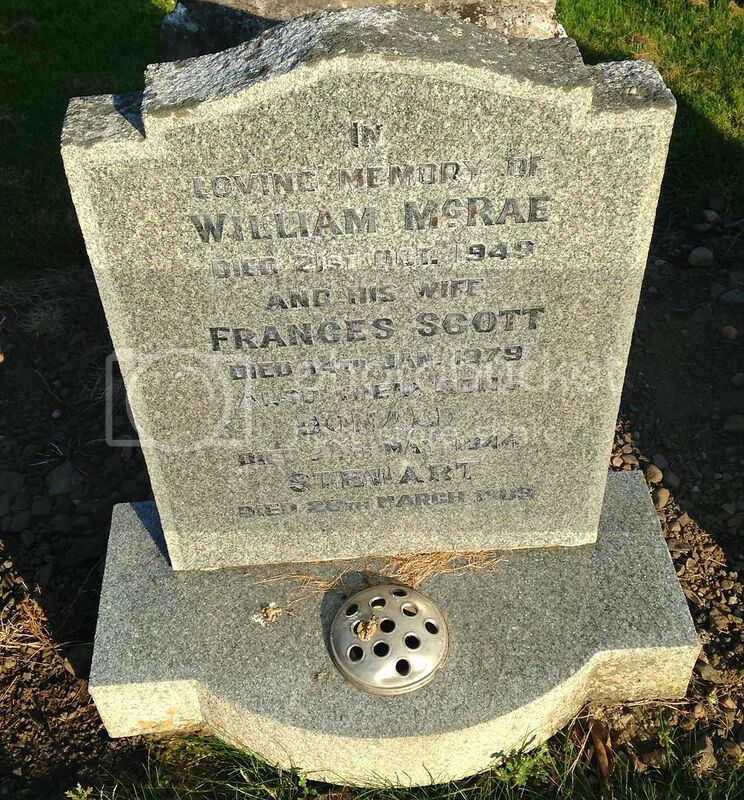 McRae of Tayport, Fife. Headstone in Palestine reads 'Til Memory Fades and Lie Departs He Will Live Forever In Our Hearts'." Regiment/Service: East African Army Service Corps. Cemetery/Memorial: Zomba Town Cemetery, Malawi, Africa. Grave Reference: 164. Additional Info. 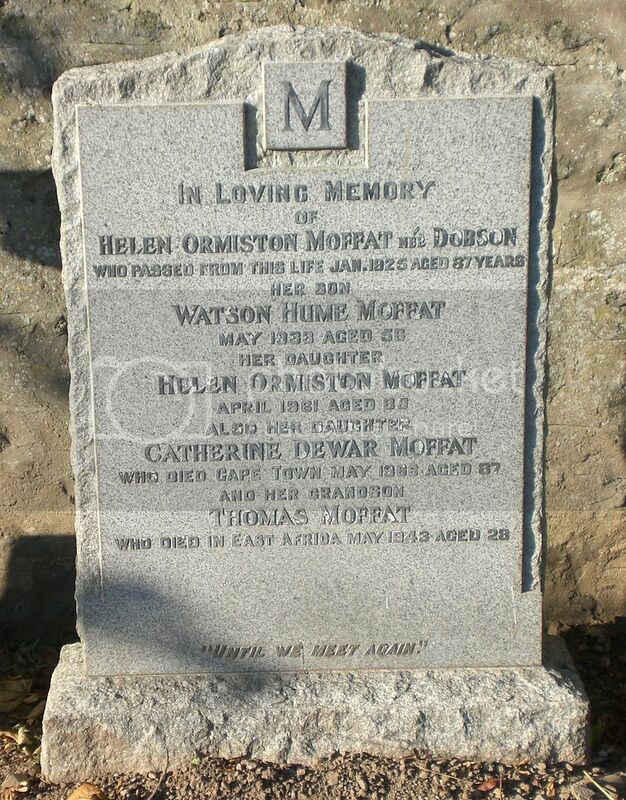 Born Dundee; son of Watson Hume Moffat and Mrs Violet McKeane Moffat. 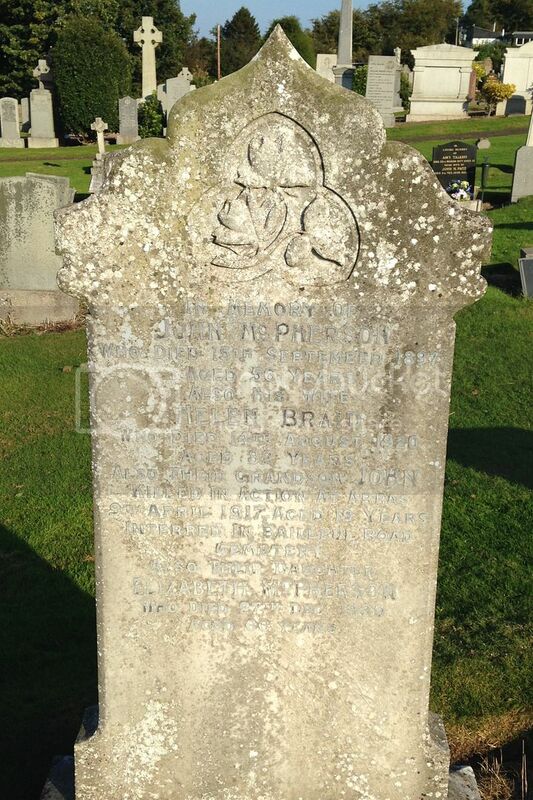 Headstone in Tayport reads 'May 1943 Aged 28' CWGC have a date of 14 April 1943 making him 27 at the time of death. Posted: Mon Mar 21, 2016 5:31 pm Post subject: Moon, James. Cemetery/Memorial: Dar Es Salaam War Cemetery, Tanzania. Grave Reference: Coll. Grave 8, E6 - 13. Additional Info. 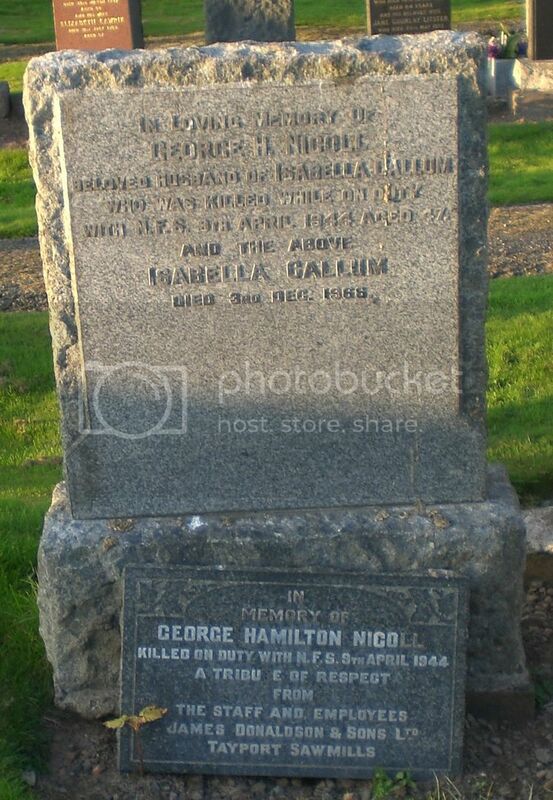 Son of Charles and Isabella Moon of Tayport. Posted: Mon Mar 21, 2016 5:33 pm Post subject: Nicoll, George H.
Additional Info. Leading Fireman, N.F.S. Son of Joseph and Mary Nicoll of 14 Pond Lane, Tayport; husband of Isabella Drummond Nicoll of 2 Rollands Wynd, Tayport. Posted: Mon Mar 21, 2016 5:35 pm Post subject: Pow, William R.
Additional Info. 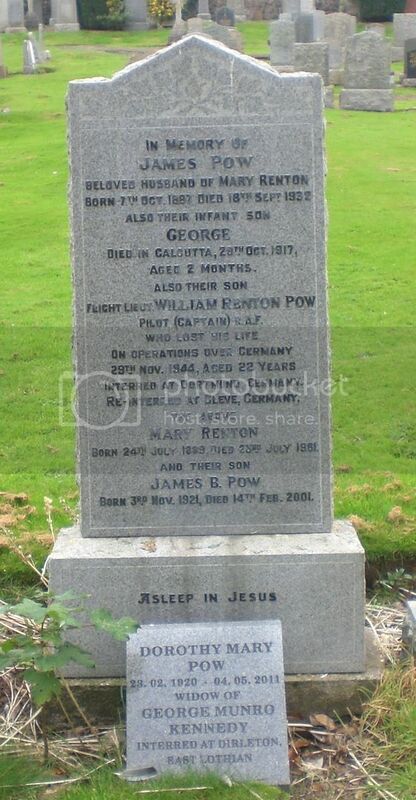 Son of James and Mary Renton Pow of Tayport, Fife; brother of James B. Pow. 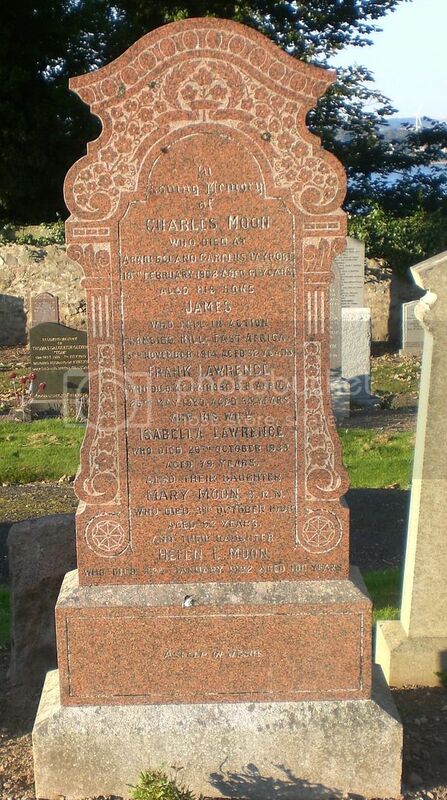 Headstone in Germany reads: Beloved Son of Mary and the late James Pow, "Allandale", Tayport, Scotland. Posted: Mon Mar 21, 2016 5:36 pm Post subject: Quinn, John C.
Cemetery/Memorial: Birkenhead (Landican) Cemetery, Chesire, England. Grave Reference: Non-Conformist Sec. 6. Coll. Grave K.4. Additional Info. 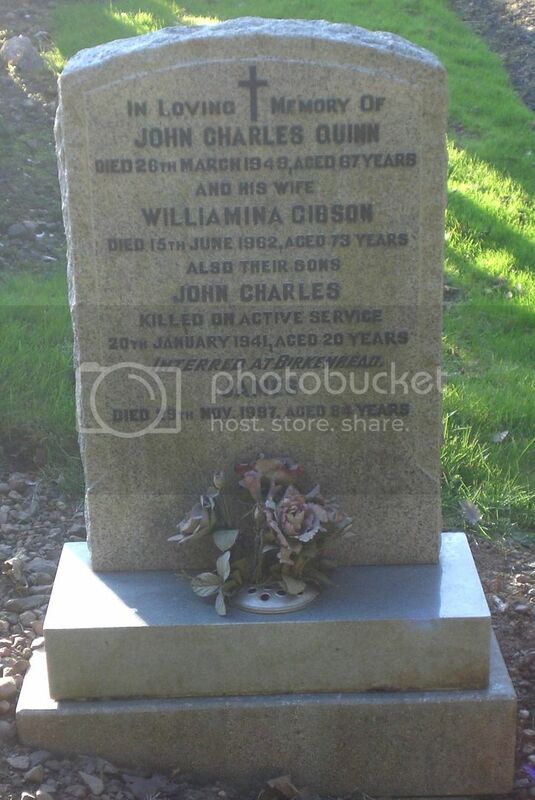 Son of John Charles and Williamina Gibson Quinn of Tayport, Scotland. Headstone in England reads: In Loving Memory of a Beloved Son and Brother. R.I.P. HMT Relonzo struck a mine and sunk off Liverpool. Posted: Mon Mar 21, 2016 5:37 pm Post subject: Redpath, James. Cemetery/Memorial: Vermelles British Cemetery, Pas de Calais, France. Grave Reference: II. H. 30. Additional Info. 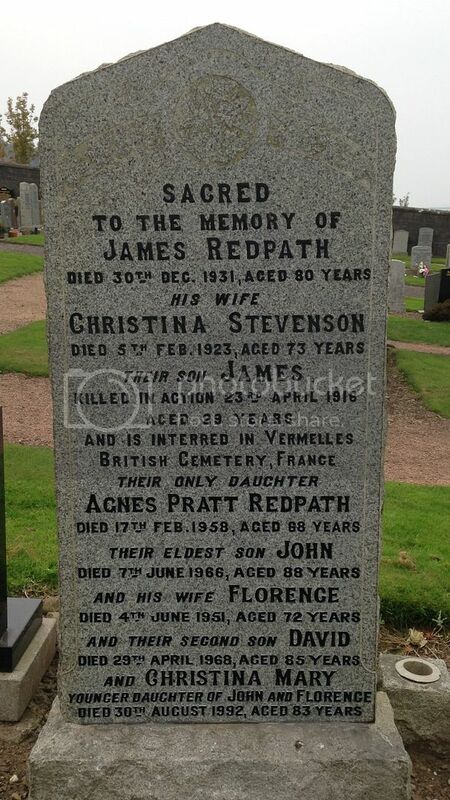 Son of James and Christina Stevenson Redpath of 1 Ogilvy Street, Tayport. Headstone in France reads 'Son of James and Christina Redpath. Tayport. Fifeshire'. Posted: Mon Mar 21, 2016 5:38 pm Post subject: Scott, James S.
Cemetery/Memorial: Ypres (Menin Gate) Memorial, West-Vlaanderen, Belgium. Grave Reference: Panel 18 - 26 - 28. Additional Info. Son of James Murdoch Scott and Mrs Elizabeth Henderson Scott. CWGC list him as a 'Private' although family headstone reads 'Lance Corporal'. Posted: Mon Mar 21, 2016 5:39 pm Post subject: Smith, Henry F.
Cemetery/Memorial: Tower Hill Memorial, London Grave Reference: Panel 75. Additional Info. 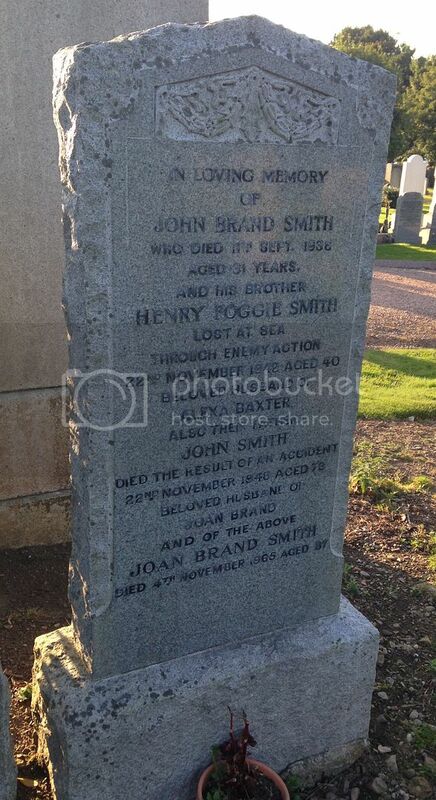 Son of John and Joan Brand Smith; Husband of Alexanderina Tait Smith of Dundee. 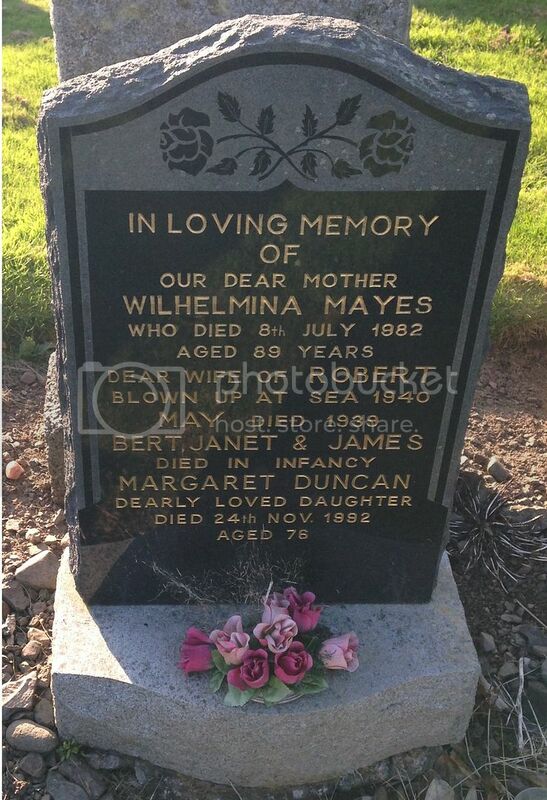 Family Headstone Gives Date of Death as 23rd of November. Posted: Mon Mar 21, 2016 5:41 pm Post subject: Wallace, Archibald M.
Cemetery/Memorial: Taukkyan War Cemetery, Myanmar. Grave Reference: 13. D. 3. Additional Info. 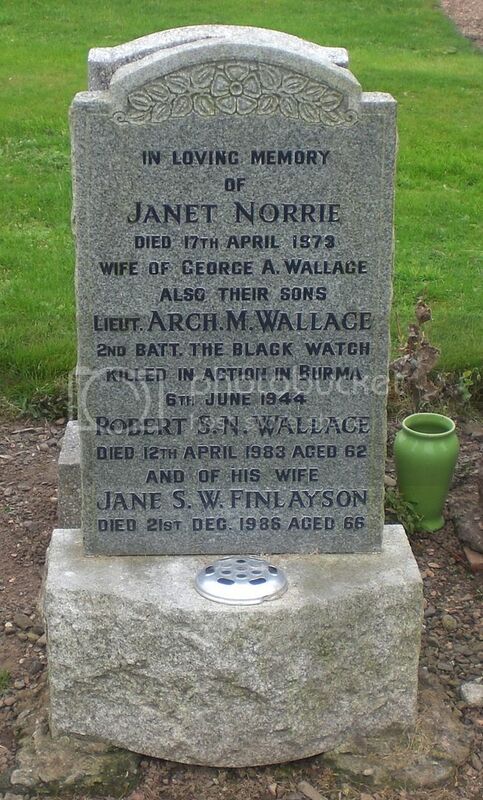 Son of George and Janet Wallace of Downfield, Dundee. 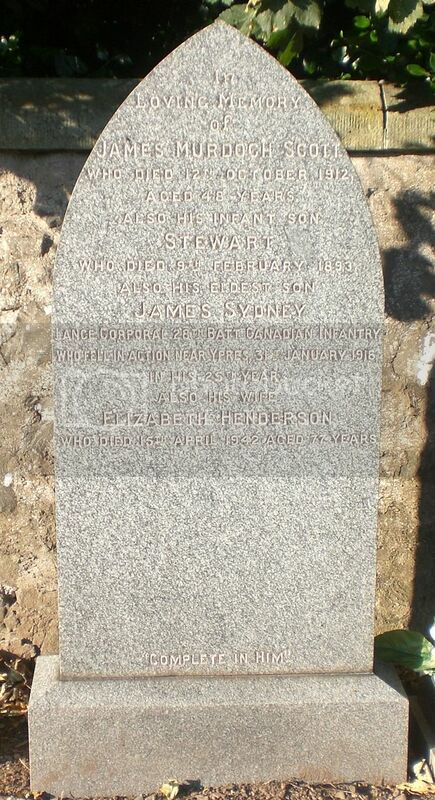 Headstone in Myanmar reads 'Born Dundee, Scotland Dearly Loved Son of G and J Wallace ""We'll Meet Again""'." Posted: Mon Mar 21, 2016 5:44 pm Post subject: Whitecross, William R.
Cemetery/Memorial: Lone Pine Memorial. Turkey (incl. Gallipoli) Grave Reference: Panel 29. Additional Info. Son of William R Whitecross and Mary Lyall. 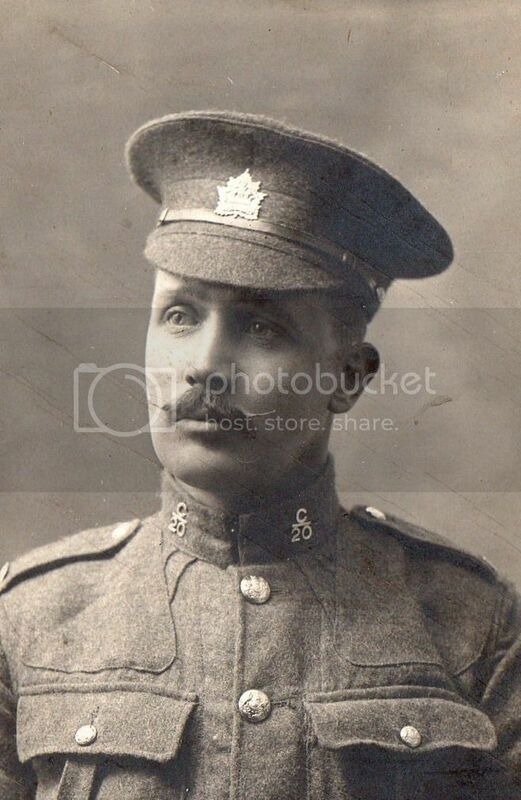 His brother George L. died in Ontario Military Hospital on the 24th Sep 1921. Medals: 1914-15 Star, British War Medal, Victory Medal"
Posted: Mon Mar 21, 2016 5:46 pm Post subject: Whitecross, George L.
Cemetery/Memorial: Eyre Cemetery, Sudbury, Ontario, Canada. Additional Info. Husband of Sarah Ann MacKenzie. Posted: Mon Mar 21, 2016 5:47 pm Post subject: Williamson, David. Cemetery/Memorial: Alexandria (Chatby) Military and War Cemetery, Egypt Grave Reference: C. 117.